The image it elicits today was probably not what Shakespeare had in mind (or was it….) Nevertheless PSD Kennels would like to invite you to come on a journey to discover the role of Canine service and MWD’s Military Working Dogs in times of war and Peace. The history of K-9s in wartime is a fascinating one. In a sense their job is relatively unchanged in that they protect their units, detect explosives, gas, drugs, and enemy soldiers. Only the technology has changed. Today’s Military working dogs are outfitted with a vast array of modern technology in order to gather intelligence and relay it to the units they serve with. Most are also wrapped in bullet proof Kevlar vests in order to make the dangerous areas they work in a little safer for the dogs. PSD Kennels is, at her beating heart, a Military and Police SERVICE organization. Our founder and Head Trainer Mr. Jaime Gascon has served his country, first as a Marine, and later as a K-9 Peace officer. It has been our HONOR to supply trained K-9 dogs for use as both Military Working Dogs and Police Service dogs to our troops and our Police Officers working the front lines. For those of you who have served this country as a member of the armed services, we salute you. We appreciate you, and most of all We thank you for your service. It goes without saying this includes our K-9 service members as well. PSD certifying Handler Canine Teams for Police work. Did you know that Dogs have been with us in every major military deployment in our countries history? But it wasn’t until WWll that the military powers that be, officially recognized the benefit of having k-9 team members. The first Official Military dog was Sergeant Stubby of the 102nd Infantry Yankee Division. Stubby started as a mascot but soon proved himself to be invaluable in the field. Legend has it that he was smuggled onto the battlefield by Private Jay Robert Conway. By sniffing and warning of enemy gas, warning when enemy troops were nearby, and locating wounded soldiers on the battlefield Sergeant Stubby forged the way for all the military dogs. Sgt Stubby is a symbol of Heroism and bravery in the Military to this very day. Today there are approximately 2700 Military Working dogs on active duty with the US military branches and of these, there are approximately 700 currently serving overseas. MWD’s play an important role in our conflict in the Middle East. claims Dr. Stewart Hilliard, Chief of Military war dog Evaluation at Lackland Air force Base just outside of San Antonio Texas. Lackland AFB is the Epicenter of all things K-9 MWD related. It houses a 15million dollar surgical treatment facility that boasts top of the line everything for our 4 legged Heroes including an MRI machine better than a lot of hospitals use. Why do most of our K-9 MWDs come from Europe? About 85% of all Military working dogs are purchased from Europe where these dogs were created to be service and Herding dogs. Unlike the USA which primarily breeds for appearance and the AKC dog show ring (mostly a beauty contest) and family companions, the European breeders have long sought to breed dogs intended for work in agriculture, military, or Police Service. These dogs are believed to be made of tougher stuff than their American bred cousins. This is the Primary reason for PSD’s initial and continued support of breeding and training programs in Europe. Our Mission to raise and train European quality German Shepherds, Belgian Malinois, and Dutch Shepherds here is the USA takes on special urgency in wartime. In the recent Middle East conflicts, one of the most important jobs for the MWD has been explosives detection. The deadly homemade IED was wreaking havoc on our soldiers and moral until the MWD’s came along and saved the day. Fully trained Explosives Detection dogs come with a hefty price tag estimated at around 150,000. US. But their true Value is in saving American lives and giving our soldiers and their unit’s piece of mind. They are about 98% accurate in their bomb detection which is better than any machine or technology the Military currently possesses so we can look forward to needing more qualified Military Working dogs in the future. The security and bomb detection capabilities render our Canine soldiers Priceless in the eyes of Military Units that have had the opportunity to work with them. Only about half of the dogs that begin training as Military Working dogs have what it takes to make the grade. Not only must they be great at sniffing out weapons, bombs, drugs, Enemies and trails, they must be comfortable biting humans when commanded to do so. Many dogs fail because they refuse to bite a Human being. They have to be very motivated to work. The ideal Military working dog will work for many hours (sometimes days) on end. A great MWD will never quit or give up while his unit is still working. They have to be aggressive and intelligent enough to get the job done yet never belligerent or insubordinate to their handlers. This is the Drive, Determination, and Mental Toughness that makes our MWD’s so special. What type of dogs are we using for MWD? When we think of Military Working dogs the image of a German Shepherd comes first to our minds and while there are many GSD’s working in Theaters of operations worldwide, in truth the military uses several different breeds. These Include the highly intelligent and very trainable Labrador Retriever. Navy Seals prefer the smaller size Belgian Malinois. Much Like the Navy Seals they serve alongside, the Belgian Malinois has earned its reputation as pound for pound the Toughest Dog in the Known Universe. Their smaller size makes it easy to parachute behind enemy lines (say WHAT?). The Malinois loves repelling into danger with their handlers. And yes for the record I DID say parachute behind enemy lines strapped to a Malinois…..
Military Working dogs and PTSD…… Yep it’s a thing! Did you know that MWD’s can also be affected by PTSD? Dogs in war zones are exposed to severe Emotional and physical trauma and not all are capable of performing the harsh job we ask of them. Between the constant gunfire, the explosives (which we now know cause brain damage) and the general chaos of war, it’s no wonder that Veterinarians say that 5% ( and the number could be much higher) of our MWD’s are showing signs of PTSD. Not surprising considering that they have been bred in Europe with the intelligence to think for themselves. MWD’s are bred to be independent and smart enough to make their own decisions while guarding livestock and working. The GSD and the smaller Malinois have long been noted for their emotional ties to handlers and Families. Since the passing of “Robbys Law” in 2000 there has been a real effort by the DOD to rehabilitate and adopt out Military Working dogs once their duty is over. The base of operations for this project is the Lackland Airforce Base. Their website is http://www.SaveAVet.org and they make every effort to provide veterinary care for the injuries these K-9s have suffered, both mental and Physical, as well as to transition the dogs back into civilian life. Not all of the dogs are suitable for family adoption. This program is unique in that they pair Human Veterans with K-9 Veterans. The Program provides both training and free housing on base for Disabled human veterans. They in turn give the dog in their care a quality of life he so richly deserves. The benefits to both Human and Dog are immeasurable. For the Human Vet he receives a stable home and is given a purpose. Caring for these Military Heroes who have served with distinction is an HONOR. For the retired MSD a place to call home and to learn once again that life can be good; Life can be beautiful in fact, especially when you have a buddy to share it with. How you can help returning K-9 Veterans today? Please check out the Rehabilitation of these amazing unsung 4 legged Heroes of our armed forces at SaveAVet.org. The waiting list to adopt is several years long and DOD gives preference to Veterans and Police officers however there are family adoption success stories. Hey we understand not everybody is prepared adopt a retired War dog. There are many other ways to make the life of these Dogs and their handlers a little better. Donations of money are always welcome as are toys and supplies for the dogs. The site has a list of much needed equipment. They are always happy to receive any help that you can give hence they have a store with a lot of great items to purchase that funds the work with our K-9 Vets. SO Let us remember the Dogs of War who did not volunteer for the task we have laid at their paws. 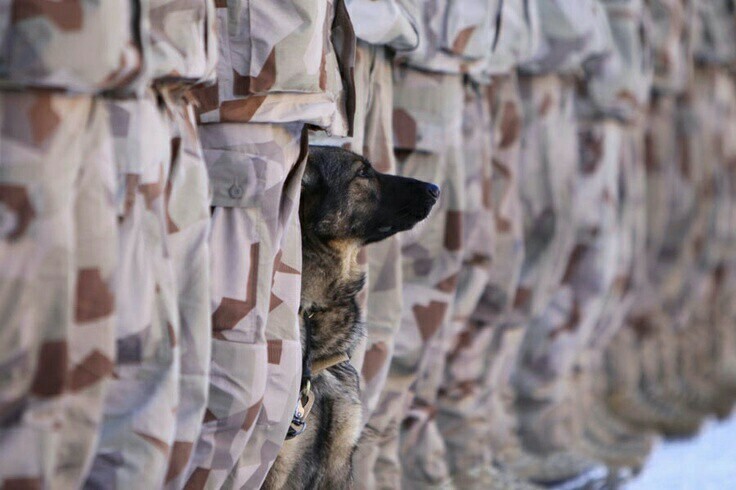 Nonetheless they have performed it with Honor, Love, and humility, that can only come from Man’s BEST friend. Indeed…I hope you will take some time on this, our countries Independence Day Holiday, to check out the amazing stories of our Military Working Dogs and to remember them in your prayers.